This is another unpublished Torres Straits figure procured by Dr. Haddon. The native name is U. Second: A second person catches the middle of the near thumb string and draws it away from you over all the other strings (Fig. 444). Third: Exchange the loops on the little fingers, passing the right loop over the left loop. Fourth: Exchange the loops on the index fingers, passing the right loop over the left loop. 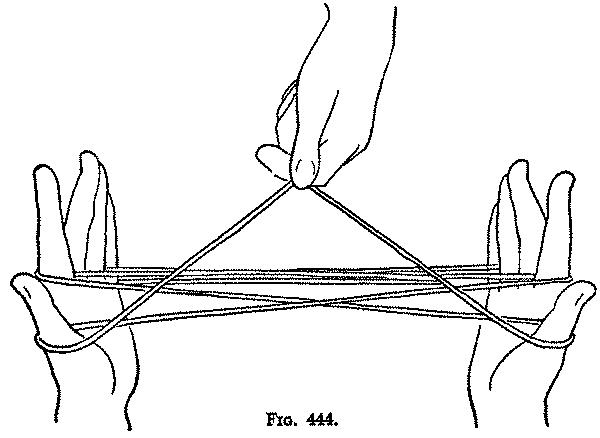 Fifth: Draw the hands toward you to pull tight the loop held by the second person, and work the strings to form the crown of the palm tree (Fig. 445). In Torres Straits this figure is formed by one person. 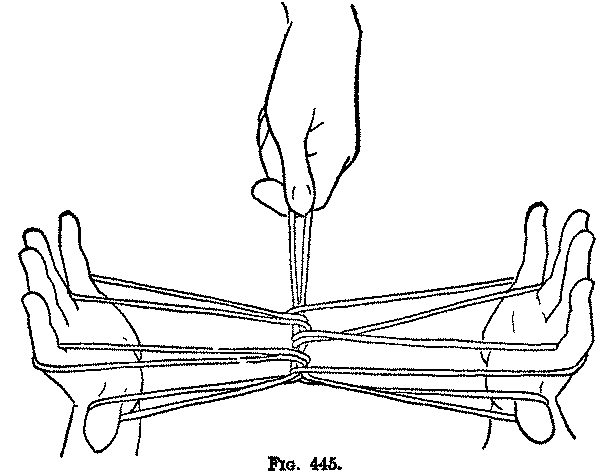 After Opening A, the four fingers of each hand are passed from above into the thumb loop and closed over all the strings except the near thumb string, to hold them tight. The hands are then turned with the fingers directed away from the body and the toe is passed up and put from the far side into the thumb loop to catch the near thumb string and pull it down.